My first full day in China was spent at Electronica, an absolutely massive conference showcasing companies involved in electronics manufacturing and distribution. It’s difficult to comprehend how large this event is, filling multiple halls at the New International Expo Center in Shanghai. I’ve seen the equipment used for PCB assembly many times before. But at this show you get to see another level below that, machines that build components and other items needed to build products quickly and with great automation. There was also big news today as the 2019 Hackaday Prize China was launched. Join me after the break for a look at this equipment, and more about this new development for the Hackaday Prize. Hackaday’s parent company Supplyframe is at Electronica in Munich this week — booth C5-223. On Thursday from 16:00 – 18:00, they’ll be hosting a Hackaday Happy Hour, with a beer and coffee bar, for everyone in the Hackaday community. They’d love to see you and hear what you’re working on, be it for your day job or your night job. If you missed the #badgelife exhibit at Supercon, it’s here at Electronica. There will also be some of those mysterious cubes you may have heard about. Richard Hogben and Bogdan Rosu will be DJing fresh beats. 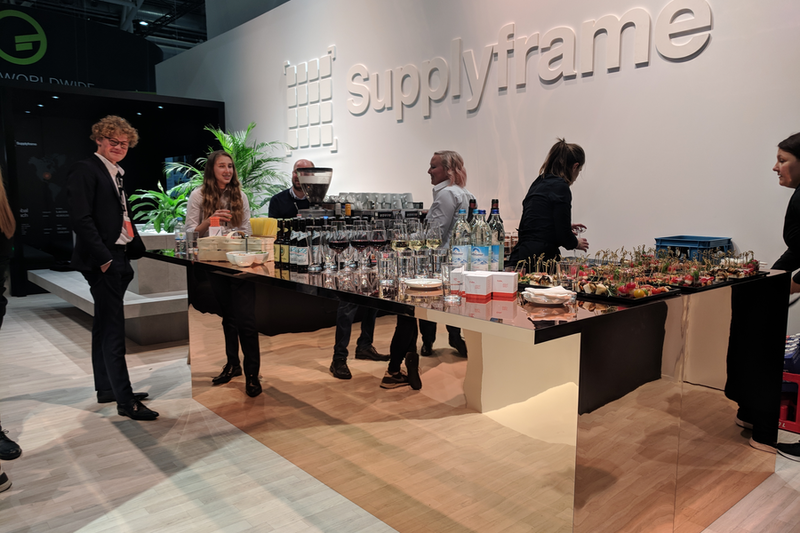 Stop by and say hi to [Sophi Kravitz], [Majenta Strongheart], [Alek Bradic], and everyone else from the Supplyframe team. Hackaday’s own [Elliot Williams] will also be wandering around Electronica Wednesday afternoon. He can’t promise free beer, but if you want to crawl around Electronica with [Elliot], meet up at the Supplyframe booth at 14:30 on Wednesday. Begin the Hackaday Superconference a day early this year. Supercon is far more than a conference, it’s a Hacker Village that forms when we all get together and that’s happening on Friday, November 10th with early badge hacking, dinner, and a party all included with your Supercon ticket! In the last year, Supplyframe (Hackaday’s parent company) moved into a new office. It’s a beautiful space with enough square footage to host a conference itself. This year we’ll be capitalizing on that by hosting some of the larger Superconference workshops there. They’ve also opened their doors and are pulling out all the stops for the meet-and-greet pregame on Friday. Just let us know you’ll be there. Badge pick up and hacking will begin at noon. If you’re itching to get your hands on the amazing Supercon badge, this is where you want to be. As we move into the five o’clock hour we’ll bring in the catering and the bartenders for a bash that welcomes back your extended family of hackers, designers, and engineers. This an amazing community and you’re a part of it so make your plans to get to town early. Is a day early not good enough for you? You’re in luck! We’ve opened up a chat room on Hackaday.io. Talk to one another about what to bring, how to get there, what to do, and who exactly already has the Gerbers for the Superconference badge. It’s going to be a fantastic conference, and we can’t wait to see you there! We’ve been trying fit in a tour of the Pacific Northwest for a couple of years now. This week is a perfect excuse. Hackaday is proud to sponsor the Open Hardware Summit which will be held in Portland this Friday! Hackaday believes in the free and open sharing of information and ideas. Open Hardware has far-reaching benefits that help to educate and inspire current and future generations of hardware developers. Open Hardware also works toward making difficult and important advancements in the state of the art available to people who have the skills and interest to incorporate them in their own work. This is why we built Hackaday.io, the world’s largest repository of Open Hardware. It’s also why we support the Open Hardware Summit, which brings together the Open Hardware community to discuss what it means to be Open Source Hardware and how to encourage the incorporation of those ideals into new products and projects. Tindie and Supplyframe are also sponsoring the OHS. Tindie is, of course, the best place to find bleeding edge hardware sold by the designers themselves. Tindie supports Open Hardware licenses and seeks to provide the best marketplace for products and their creators. Supplyframe creates cutting edge tools for engineers to build better. This year they launched the Supplyframe Design Lab which is packed with high-end rapid prototyping tools and staffed by a resident engineer; the lab unlocks the ability to turn great ideas into prototypes that can be followed all the way through to production and product. The goal is to unite all the things necessary to make great open hardware happen. There will be a ton of Hackaday, Tindie, and Supplyframe staff at Open Hardware Summit, make sure you stop by our tables, say hello, and grab some swag. But of course we want to see the hardware hacks that you’ve been working on. There are a couple of different opportunities to track down [Brian Benchoff] and [Mike Szczys] who will be on the lookout for hacks to cover in our articles. On Thursday night we’ll be at OSH Park Headquarters for their Bring A Hack party. There will also be a hardware hangout on Friday to close the day long Summit. We want to see what you’ve been building so don’t be shy! The Supplyframe Design Lab in Pasadena, CA is opening soon. This space is dedicated to making great ideas reality. It is packed with state of the art tools, with plenty of room for classes and collaboration. Professional level tools and an available workshop are just one piece of the puzzle. To be truly successful, great people need to bring the space to life with inspiring builds and forward thinking adventures. If you want to be part of this community, and have been contemplating an idea for your next product or project, consider applying for a funded residency. Art, Product, and Technology projects will all be considered. Those selected will be funded up to $2,000 per month. We want to see ambitious projects realized at the Design Lab so don’t be afraid to think big. To help in curating the best projects to fund we’d like to see some of your previous work. If you haven’t already, please share some of your builds on Hackaday.io. The first round of funded projects can be under way as early as June 1st. A little over two years ago, we announced that Hackaday became a part of Supplyframe. This was a natural fit: both sides are comprised of hardware engineers, computer scientists and hackers alike. We immediately pooled forces and set out to make Hackaday bigger, with a broader mission. So far, it has been an amazing journey: Hackaday.io is approaching 100,000 registered users, The Hackaday Prize is in its second year, and the Hackaday Store is about to fulfill its 5,000th order. The main theme behind all of this is fostering collaboration, learning, and providing incentives for everyone in the community to stop procrastinating and try to build something amazing. Hackaday.com is here to inspire, Hackaday.io to help develop projects in the open, and the Hackaday Store is to provide a way to turn passion projects into a self-sustainable lifestyle. While the road to community-powered innovation might not be easy, it’s something we’re all incredibly passionate about, and will continue investing in to further this goal. With that in mind, we’re very excited to announce that everyone’s favorite hardware marketplace – Tindie, has been acquired by Supplyframe and will be joining the Hackaday family! Apart from the fact that most of us are personal fans of the website, we believe that Tindie fills an important gap in helping projects cross the chasm between prototype and initial production. Crowdfunding provides access to capital for some (and access to laughs for others), but it’s not always the way to go. You might not be ready to quit your day job or take on a project full-time. You might be working on rev1 of the project and want to try the “lean manufacturing” thing. Or maybe you’re building something for your own purposes and have some extras lying around. Tindie is a platform that has helped launch many such projects, and we’re incredibly lucky to have it be a part of Hackaday. Naturally, the question that’s on everyone’s mind is, what happens next? Are we going to mess things up? Paint Tindie in black? Change the fee structure? While we have ideas on things that we could help with, our main goal will be making sure that the Tindie community continues to thrive. The only changes we’re interested in are the ones that make the community stronger. We are fascinated with the challenges surrounding the supply chain and will be looking into tools to help sellers improve margins and ship better products. Hackaday.io and Tindie combined represent the world’s largest repository of (working) Open Hardware products, so we will be looking into more closely integrating the two. We will also make efforts to grow the overall Tindie audience, as every new buyer helps move the community forward. All of these are some of the ideas, but we’re ultimately looking at you for guidance: things we should do, problems we should attack, dreams of future capabilities. Wish us luck in this new adventure. Some people would look at a massive 6’x4′ LED matrix hanging on the wall playing animations and be happy with the outcome. But [Ben] just isn’t one of those people. The original FLED (Fantastic LED thingy) was eight rows of twelve addressable LEDs for a total of 96 pixels. This spring he upped his game and retrofitted the display with 1768 LEDs. It wasn’t simply an issue of restlessness, the original build suffered from LEDs dying. We actually featured it for that reason as a Fail of the Week. This is not strictly a hobby project, it’s hanging on the wall in the Supplyframe offices, so pulling it down frequently to fix broken parts is not ideal. To make FLED more reliable [Ben] sourced strips of the new APA102 LEDs which we looked at back in December. They use an SPI bus instead of the bizarre timing scheme of the WS2812. At first glance you’d think this would mean easier assembly compared to soldering both sides of each of the original 96-pixels. These do come in strips, but laying out 52×34 still means soldering to the ends of each row. A lot of love went into making sure those rows were laid out perfectly. A sheet of white foamed PVC serves as the substrate. There is grounding braid on either end of the rows, one is the voltage bus, the other is ground. It fits the original enclosure which is acrylic and does a great job of diffusing the light. I’ve seen it in person and it looks pretty much perfect! It’s not just the physical layout of this many pixels that is a challenge. Pushing the data to all of them is much harder than it was with 96. [Ben] transitioned away from RaspberryPi. He considered using a Teensy 3.1 and ESP8266 but the WiFi of these cheap modules is far too slow to push frame information from a remote box. In the end it’s a BeagleBone Black that drives the reborn display. This is a great choice since there’s plenty of power under the hood and a traditional (and much faster) WiFi dongle can be used. Don’t miss the animation demos found after the break.